For his current exhibition, ‘La levadura y el anfitrión’ (The Yeast and the Host) at Museo Jumex in Mexico City, Philippe Parreno is asking you to suspend your belief in the gallery as it’s traditionally conceived, as a white cube designed for the display of objects. 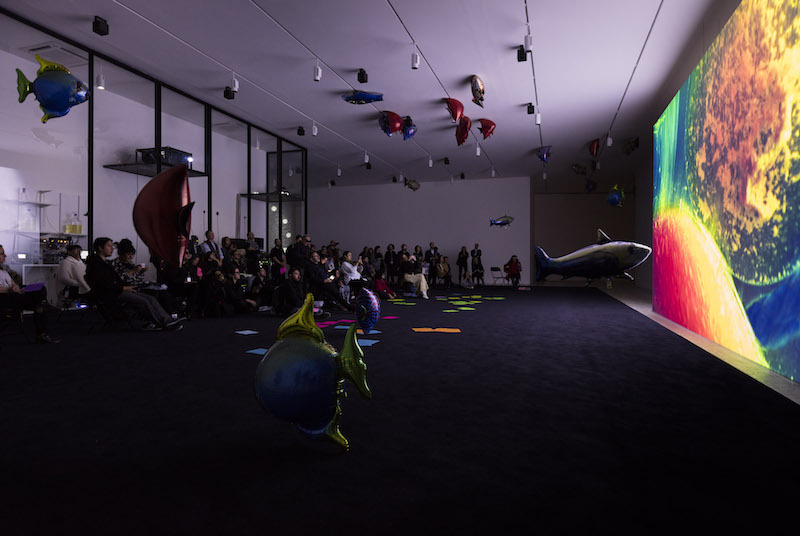 Exhibition might not even be the most accurate term for Parreno’s show: it’s more akin to a playground, an exercise in conceptualism made famous in the 90s through the practice of curation and installation by Parreno, Dominique Gonzalez-Foerster, Pierre Huyghe, and their contemporaries. On the second floor of the Museo Jumex sits a sophisticated control center, the nexus of Parreno’s exercise in what French art critic Nicolas Bourriaud called “relational aesthetics”. In this room, Parreno’s toy chest of sights and sounds is wide open, leading to endless, open-ended simulations. There’s something else at work within this alternate reality, perhaps a nod towards singularity. Our movements and our presence within the space are immune to passivity. In gestures big and small, we interact as one with the machines turning the gears. 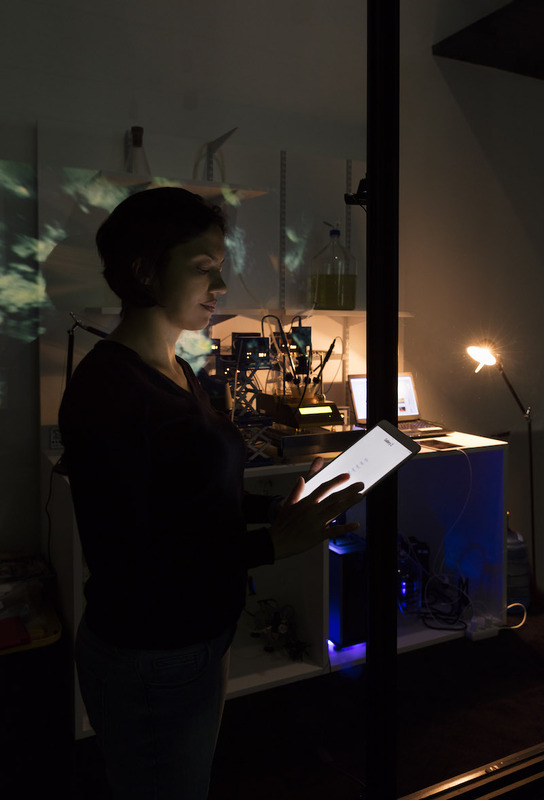 The variables Parreno uses—film, props, sound—create an installation built for human interaction as a poetic contamination. The narrative of how the exhibition moves is partially dependent on our synergy with the various media. The direction is also built upon the program from the artist’s 2016 exhibition, ‘Anywhere’ at Tate Modern, which is written into the computer at the center of the exhibition, in turn connected to a bioreactor breeding yeast whose growth influences the program’s simulation, all installed behind a glass facade. Are the programs at the heart of the exhibition controlled by a living bacteria, capable of memory and error? Or is the organism simply a conduit to a higher, artificial authority? Parreno gives us much to process. This makes each encounter inside the installation a unique, singular experience of resistance and flow. In turns, the world of ‘The Yeast and the Host’ is a collaboration between Parreno’s choreography and the learning curve of an A.I. Taking a seat amid the scattered folding chairs in the darkened room, you have to navigate fish balloons in your path, which float collectively through the space. Once seated, it’s up to you to adjust your chair to face different points of view. Here is only one possible set of outcomes: you turn your chair around to face the machine nexus encased in glass—the brain of this monstrous work—watch as an orchestra of lights perform with no conductor, then spin back around to follow the activation of various video pieces. It is likely that the balloon fish will make their lap back in your line of sight, obstructing your view once or twice. Then the images will go dark and activation will take place across the room. The onus is on you to stand up and follow the noise to a piano playing a recital on its own. The introduction montage of HBO’s ‘Westworld’ comes to mind, which depicts A.I. behind the controls of a piano’s keys. These algorithmic systems take the place of human hands making intentional cues within the exhibition. The forces at play might begin with the museum’s curator and Parreno himself, but left alone, they evolve and become something more, an alternate reality or a cyborg ecology. Exploring the exhibition a floor below, we see here, too, mechanic systems are at play, affecting the performance of the floor’s main attraction, the piece ‘Marquee’, which by name and form begs you to come hither to its flashing fantasy. 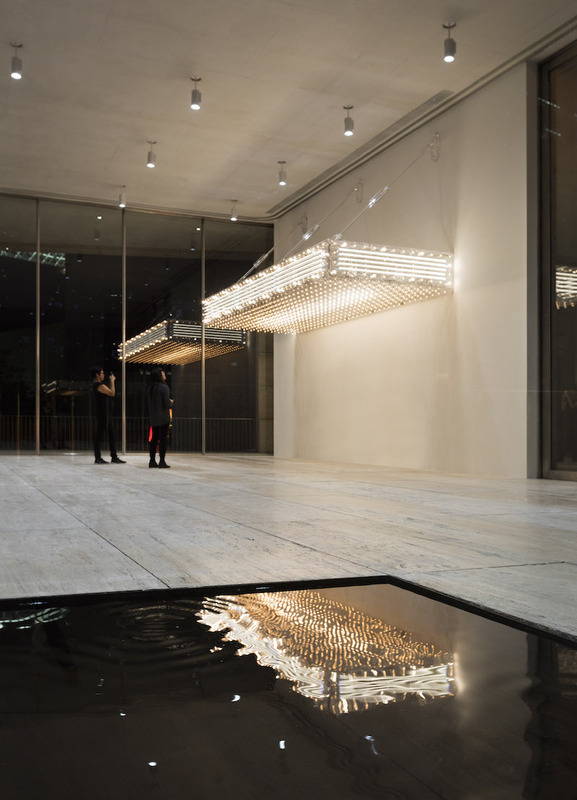 Made of translucent acrylic glass, steel, incandescent light bulbs, fluorescent tubes, and acrylic glass chains, this installation acts as advertisement to the films and fantasy awaiting you upstairs. With ‘Marquee’, Parreno has stripped away the outside shell of a sign and left only the guts, the ghost. We have seen this signifier enough to know what it suggests. 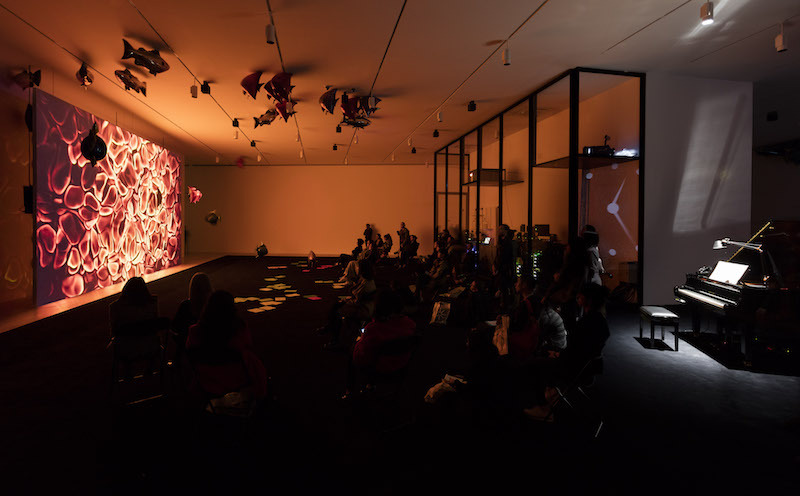 However, by removing the text and language behind its interpretation, Parreno focuses on the sights and vibrations that make the piece a sentient instrument. It’s evident ‘Marquee’ and the world-building of the exhibition itself weren’t born of subtlety. That’s simply not part of Parreno’s work, nor that of his contemporaries: theirs are practices full of sound and fury. We emerge out of Parreno’s world dumb and dizzy, trying to regain our footing in reality and wondering where the time went.